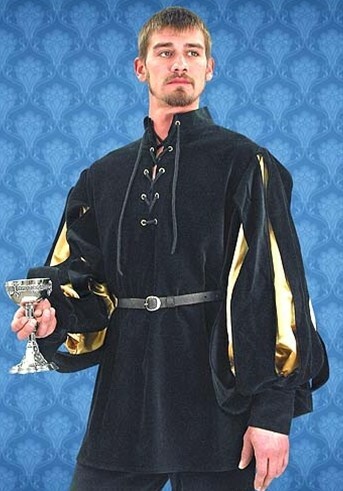 This dashing period shirt is rich, black cotton velvet with slashed sleeves. Choose Black with gold or silver satin inner sleeves. Eyelet and lace close, high stand-up collar, in sizes Small/Med or Large/X-Large. $77.95 plus shipping Choose color and from dropdown lists, then click "Add to Cart". Shoulders 21" 22" 22" 22" 23" 23"
Chest 40" 42" 44" 46"50" 44"
Sleeves 26" 27" 28" 29" 29" 28"